A rolling luggage set offers matched bags of varying sizes that usually nest into each other for storage. The convenient sizes work for every trip whether you need a carry-on, weekend bag or luggage for an epic journey. In the beginning it was the black flight bag seen rolling behind frequent travelers but that has morphed into a spectacular array of colors, sizes and styles of wheeled bags from which to choose, not to mention the number of wheels. They range in number from a set of 2 to as many as 5 pieces and are available in hard and soft sided versions. A few tips before you get started - keep it light, easy to identify and appropriately sized for the way you travel. Check measurements carefully against the airlines you intend to use for compliance with their regulations, remember to include the wheels and handle (in its collapsed position) in the measurements. 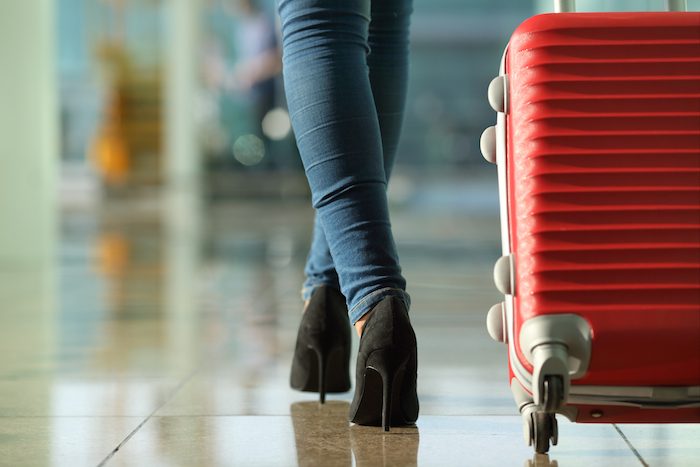 The Samsonite name has always inspired trust when it comes to luggage and it's easy to see that they've kept pace in the industry. This 2 piece set is the perfect ensemble for a single traveler on a one or two week vacation (depending on your packing habits and whether you're headed to a hot or cold climate). A slightly textured polycarbonate surface resists scratching and scuff marks. The carry on measures 19 x 14.5 x 9.75 and weighs 6.8 pounds empty. It fits comfortably in the overhead compartment of major US airlines. Dimensions of the larger bag come in at 24 x 17 x 11 and weight is 8.8 pounds. Nicely sized for checking. Both cases are nylon lined on the insides. 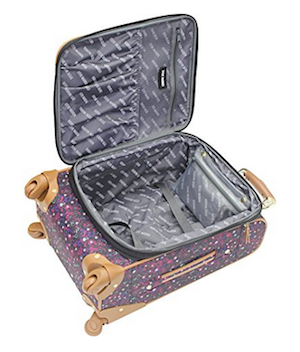 One side of the suitcase has criss-cross straps to hold folded items or packing cubes in place. The other side has a zippered flap that completely encloses it. Four omni-directional wheels on each of the suitcases make them easy to maneuver when you're on the move and stand in place when you're not. TSA approved locks provide security while making the contents accessible to authorities. Need a little more room? The 2 piece set is also available in 20" and 28" sizes here. the perfect ensemble for a couple on a week long tour. Longer if you've joined the increasing number of savvy packers. Samsonite's 3 piece set combines all of those holy grail features that travelers value. Durable, lightweight and scratch resistant with zippers, wheels and handles that are solid and dependable. Included in this hard sided set is the carry-on at 20 inches high and two checked pieces at 24 and 28 inches high. Carry-on measures 22.5 with wheels and handle. Each of the cases expands via a zipper that runs the circumference of the bag. I love expanding bags for the options they allow. They're fantastic for fitting in souvenirs to bring home or taking gifts or donations however it's easy to overpack and turn your carry-on into a checked bag and your checked bags into over-sized or over-weight with the charges and inconvenience that would accompany it. A mix and match of options this gorgeous ensemble offers a perfectly sized piece for any vacation. Grab the carry-on for a weekend getaway or take it all on a months long journey for two - it's all right here. Wheels on all but the carry-all make it easy for two to move the entire set of bags from one place to the next. Beautifully lined the insides have pockets for shoes and to keep your belongings organized. One of the best features of soft sided luggage is the abilty to have easy-to-access pockets on the outside of the bag in which to keep documents and necessities handy. The pieces nest inside each other for ease of storage.